I play-test a lot of racquets and usually don’t put a lot of wear on them. So this is your chance you TO FIND SOME NICE TENNIS RACQUETS FOR SALE AT A GOOD PRICE. Don’t hesitate to ask questions about any of thEM. Wilson Pro Staff Classic 6.1 95 (first edition). Grip 3. 8/10. €90 each. EU – 15 for one, 20 for two. WORLD – 20 for one, 25 for two. 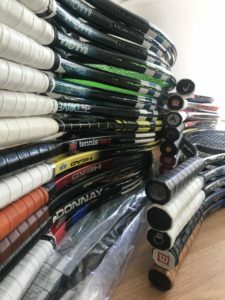 Do You Need a New Racquet? *Specific Time Used (must give specific time, must be over 30 minutes): 10 hours each. *General Description (including any cosmetic blemishes): Good as new. Can you give more info about the weight. Also can you send some picture of the handle. I am looking for a Prince CTS Synergy DB 26 Mid-Plus. You wouldn’t happen to have one of those, would you? Hi I’d interested in the blacked out Dr98. If you could get back to me as soon as possible i would appreciate it. I ‘m looking for Babolat Pure Drive Roddick Plus (2012 or 2013) model with grip size 4 3/8. I will have a look among my contacts. Until then I suggest you put up a wanted ad on stringforum.net and possibly tennis warehouse forums. How much for the head radical? Not sure if I want to sell it yet – it’s playing so good! 🙂 Send me your offer to hello@tennisnerd.net and I will consider it. Can you please compare stiffness/comfort of Radical and SixOne to Angell TC97 ? The Angell TC 97 and HEAD IG Radical are close in terms of stiffness, or should I say flex, hovering around 61-62. Personally I feel like the Angell TC 97 is more plush and low-powered than the Radical, but the Radical with its open string pattern provides more spin. The Six One is not uncomfortable despite higher stiffness (around 65-66 RA), but definitely crisp and powerful. It is heavier to swing, but with its ultra head light feel it is quite playable. Nice playing with Andy! 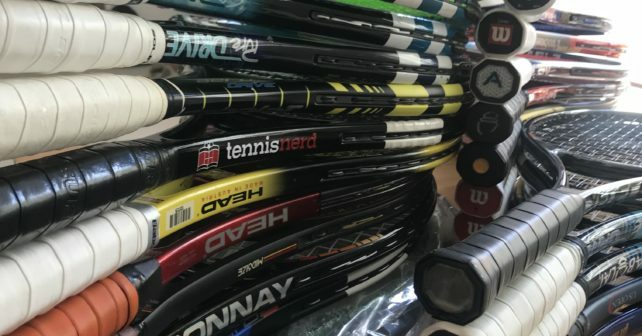 Unless you find a guy with good connections or a pro player who wants to sell some of his test racquets, it’s going to be hard to find blacked-out (unpainted) Babolats. The guys at prostocktennis.com might get an occasional blacked-out Babolat racquet so check their website. These racquets rarely retail below 300 euro however. Hi… Do you have the Rafa juice cans for sale as a novelty collector’s item? Hi! Are the ultra tour and rf85 still available? Prices? Also, where can we see the most updated “for sale” list (here, instagram, forums etc)? Sorry, been too busy to update. RF 85 is still there for 150 euro. Ultra Tour is gone. I am interested in Radical LM. I only have a couple left and not sure if I want to keep them or sell them right now. I will get back to you. Do you still have the Yonex pro 330g? If yes, what’s the price + shipping to greece? Is the dr98+ still available? Hi Jonas! Sent you pm in sf and ig as well. Interested in prince 93p. Hey there, do you have any Angell racquets for sale? It plays like the HEAD Prestige Classic 600? Yes, it is still for sale. It plays quite similar to the Prestige Classic 600, yes. I want to buy the HEAD Graphite Pro. The handle is the original from Head (I prefer the Head shape over the Wilson)? I was wondering if you had/know of anyone selling a Prince Textreme Warrior 100? Did you had selling the Snauwaert Hi-Ten 30? Hi, Do you still have available the babolat soft drive racquets? Do you still have your babolat soft drive? Yes, I have three. Two grip 2 and one grip 4 (with Kimony leather grip it is like 3). They are worn but very much playable and lovely to hit with. You can check Racquet Depot UK: http://a.racquetdepot.co.uk/192.html – They have brand new pallets at a decent price. I can check if I have any lying around. What shape do you want? Traditional HEAD: TK82 or more rounded TK82S? How does HEAD Flexpoint Radical MP play/feel compared to other classic Head rackets and Angell’s you have used ? Regards from the land of Gulbis. In regard to this topic my question is – will you be able to ship to Latvia? I was looking for LM Radical in Europe on eBay and the selection is super limited. Yes, I can ship a LM Radical Tour to Latvia. I have a few of them. Sent you an e-mail with pics just now! I’ve played with a Wilson Blade 18×20 for nearly a decade and have been playing a Pure Strike project One7 for several months. The Pure Strike has a great blend of power, touch and maneuverability. What racquet would you recommend that plays like the Pure Strike but is easier on the arm. Do you play with 18×20 or 16×19 on your Pure Strike? Hi, I’m interested in the LM Radical Tour. Can I ask you a question about this frame? Sadly, they are all sold. I have two Flexpoint Radical MP that play close, but are lighter. So if you add lead tape they will play similar. I have a TGT293.2 in touch pretige pj, 318gr strung with overgrip, lead + silicone. Grip L2. 9/10. I’m interested in your babolat aero pro drive pro stock. Do you want to make a trade? do you know, if the actual Yonex Vcore 95 (the Shapovalov endorsed one) plays similar to the Yonex Vcore 95D or do you know where to get an actual 95d? I loved old radicals and bought 2 used of my fav online. Grey and yellow stripes radical tour. One uses a TK 82 pallet and is 1/8” longer and 1/16” narrower at head than one that uses foam grip and is 1/8” wider? Do I have a fake radical or 2 different countries of origin? I’m really interested in the Tecnifibre Tfight 305 XTC. Can you please send me some pics at this email address: benny96nzabenna@gmail.com? I’m really interested in the Tecnifibre Tfight 305 XTC. Can you please send me some pics? Will you be selling your pair of H22? Which are the specs? Also, how much are you asking on the tecnifibre rackpack? Yes, I will. The specs when I bought them (used by French pro). I added some lead tape on the handle to make it more head-light, but that is easily removed. Send me an e-mail at tennisnerdnet@gmail.com if you’re interested in the bag or H22 or all three. Is the ProKennex Ki Q+ 5X Pro available and do you ship to puerto rico? Are you selling the tc95 310gr/315mm 70ra that you reviewed? If so what is the grip size/shape? Do you have a couple Prince Phantom Pro 100P or Wilson Blade 2015 18×20 in grip size 3 that you plan to sell? I would also want to know how does it play compare to Prince Textreme Tour 100P 20145? Sadly, no Phantoms or Blades left here. Hi Jonas, just wondering if you have any Babolat racquets for sale. Looking at the old school Wilson’s. Wilson 6.0 95 Kevlar version do you have? and the Wilson 6.1 95 Classics (1st ed)? 1x 6.0 95 in grip 2. 2x PS 6.1 95 BLX, grip 3. 1x PS 6.1 95 Hyper Pro Staff, grip 1. Hi Jonas do you still have the Babolat Pure Drive original grip 2 available? Hi Jonas is the Babolat Pure Drive original grip 2 still available?